What the bombings in Ankara tell us about Turkey’s true motives in Syria. 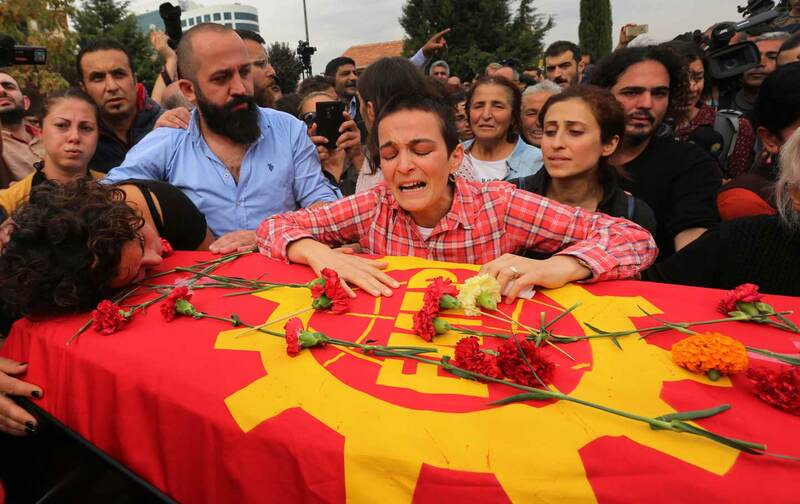 On Saturday morning, in the Turkish capital of Ankara, two suicide bombers targeted a Kurdish-Turkish trade union peace march, killing over a hundred civilians and wounding hundreds more. The motives that drove the killers, who are widely believed to be radical Sunni sectarians, are not hard to divine. Kurdish militias, the People’s Protection Units in particular, have been among the most successful fighters against the Sunni Islamic State. As is widely known—but rarely acknowledged—many IS-affiliated jihadists cross the Turkish border with Syria with impunity. This enables them to return to Turkey to target ethnic Kurds and their Turkish supporters, such as had gathered at the rally this weekend. This is but the latest incident of Sunni extremists’ targeting Kurds and Turkish supporters in Turkey. In July, a rally of Kurdish-linked activists was targeted by a suicide bomber who killed 32 people. After the attack, the government in Ankara, led by Turkish President Recep Tayyip Erdogan, suddenly decided to join the US-led coalition against ISIS. But it quickly became clear that Turkey, rather than adhering to NATO’s playbook and targeting Islamic State redoubts, had entered the war to in order to bomb Kurdish, not Islamic State, positions. Taken together, these incidents point to two characteristics which can now be said to define US-Turkish relations: double games and double standards. The double game Turkey is playing with regard to NATO, of which it has been a member since 1952, and ISIS has been clear since the start of the Western-supported uprising against the secular Assad regime in Syria in 2011. It is no secret to Western intelligence agencies that the most extreme Islamist elements of the anti-Assad forces, ISIS, or Daesh as they are known locally, have been crossing over the Turkish border into Syria in droves with the acquiescence—if not active assistance—of Erdogan’s government for years. As the widely respected Middle East correspondent Pepe Escobar has wryly noted, even “the desert pebbles” were aware that our ostensible NATO “ally” Turkey has been playing a double game from the outset. Yet with the entry of Russian forces into the region, Turkey’s double game looks increasingly untenable. There is broad support for the Russian airstrikes not only among the Kurds but among the Shia population in Iraq as well. And while the Turks have, for now anyway, acquiesced in allowing the Russian airstrikes—though just how they could stop them is not at all clear—Erdogan clearly does not approve of what is currently taking place. And yet, even as Russia flies bombing sorties over ISIS-held territory, on Monday, October 5, NATO convened a meeting to condemn two alleged Russian incursions into Turkish airspace. The White House, which never misses a chance to miss the point, also weighed in, with spokesman Josh Earnest telling reporters that the United States shares Turkey’s “significant concerns, and the United States has been consulting with our NATO allies about them.” Earnest might also have taken the opportunity to politely ask Turkey to stop financing ISIS, while simultaneously undertaking an air campaign to murder ISIS’s most effective enemies, the Kurds. But alas, all the Sturm und Drang over Russia’s alleged violation of Turkey’s airspace is a convenient way for Erdogan to distract world opinion away from what Russia is actually up to. In its efforts to help prop up Assad, Russia is busy destroying the infrastructure through which the Islamic State receives much of its financing, which comes mainly from oil revenue. And it is here we get to the issue of American double standards. Not 48 hours into its air campaign against anti-Assad forces, Russia was repeatedly and loudly condemned for intentionally taking its eye off the ball by bombing so-called CIA backed “moderates” (or as The New York Times credulously referred to them, “independent Islamists”) rather than flying sorties over ISIS-controlled territory. Yet last July, when Turkey suddenly joined the air war over Syria, it bombed Kurdistan Workers’ Party positions in lieu of ISIS strongholds, and yet NATO and US spokesmen could summon up nary a word of condemnation against Erdogan’s treachery. The problem with the Turkish campaign, such as it is, is that the Kurds—besides being the most effective anti-ISIS fighters—pose no threat to US national security interests—while ISIS, should it prove victorious in Syria, would transform itself from a regional security threat into a something altogether more threatening. A second—and less remarked-upon—double standard with regard to US policy toward Russia and Turkey is that in Turkey we have a treaty ally which tramples on “human rights” every bit as hard—if not harder—as the despised Russian President Vladimir Putin. Still worse, Erdogan, unlike Putin, is acting as a defender of the radical Islamist forces that attacked lower Manhattan on 9/11, while Russia, which our political establishment insists on seeing as enemy number one, is fighting them.